I was re-reading the January House Beautiful at the gym, as the first time I read it I was on a plane couldn't really focus on anything other than the turbulence. I am so glad I did because it contained my new dream kitchen? I love everything about it--especially the sink and the freshness of the all white! Not quite sure I would want to see myself in that mirror while cooking--I am not the cleanest chef (think flour all over my clothes and face). I really like that light fixture above the window and the sink. I'm not sure about the mirror, but it is certainly interesting. I actually really like the mirror... it is unexpected and gives the kitchen a "roomy" feel - sometimes I think that the kitchen is treated like an un-room. ps, - how do you read mags at the gym? I need to get on that plan! love the white! always love wood and natural mixed with clean lines and simple! Beautiful! Post a photo of your kitchen some time! isn't january 2009 issue fabulous! I marked that same kitchen!! I too read the issue on a plane and had completely terrifying turbulence (i usually don't mind turbulence) but this was hot coffee in one hand, holding magazines in the other, trying to tuck mags in back pocket to grab lunch that was flying everywhere!! I was so stressed, i left 2 of my magazines in the back pocket!!! Oh so cute - if I had a mirror in the kitchen I might pretend I was on a cooking show! 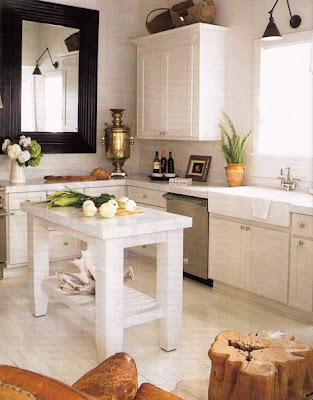 love this kitchen, the furniture, the crisp white, that giant mirror! I loved this kitchen too, and I love that the mirror feels so unexpected in the space! i was in love with this kitchen too. i'm such a sucker for a kitchen that doesn't *feel* like a kitchen.